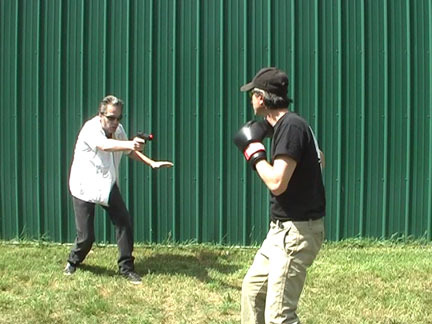 Last Saturday we spent the day doing some excellent training in Close Range Instinctive Pistol for our July Swamp Seminar, and like with the previous Instinctive Rifle Clinic and Shadow Shield Matrix events I'd like to invite you to attend from wherever you live through the magic of DVD! 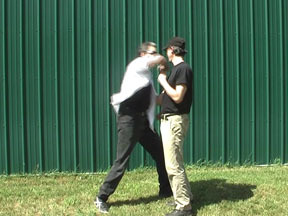 While it might seem unusual to introduce the left hand so soon at the beginning, because we're working on truly Instinctive methods the fact is that it doesn't matter which hand you use. 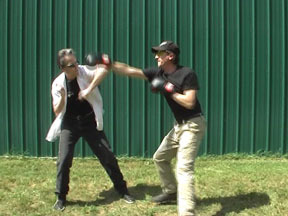 Learning to use the left hand early in your training builds confidence in addition to skill, and it may be useful in combat if for some reason your right hand was injured or otherwise occupied. 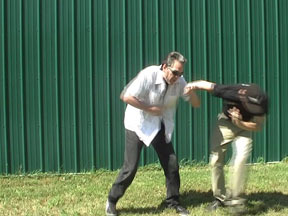 A unique moving target that we used throughout the day (and that we show how to build on the Seminar DVD) is what we call "The Ghost". This target system is capable of moving up, down, left and right, towards or away from the the shooters firing arc. It can move fast or slow and is very agile, seemingly alive. The Ghost can be as easy or as challenging a target as you desire and it costs less than $20 to build - you may even have everything on hand already! Once everyone could hit the swiftly moving Ghost targets, it was time to add in the draw. This is a critical area that separates those who just shoot recreationally and have no need or interest in producing the weapon from those who carry a licensed and concealed pistol as a civilian or who carry a weapon as part of their "job requirements" (LEO and Military). After a well earned break we went into our second block of training which was in applying all these lessons against a resistant opponent. 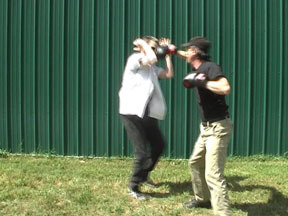 These close shooting drills drills are tiring and contact-based, but they graphically prove the need for a solid base of unarmed fighting skills that is integrated with the other weapon platforms. 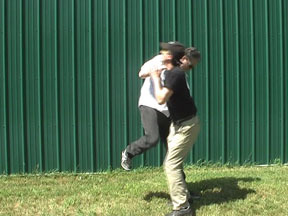 A typical drill might involve being rushed by an opponent and having to control the clinch before striking and trapping them as a way of allowing you to safely draw while still at contact distance. Sweaty and exhausted but smiling and eager to do more, we shifted gears and moved into "Cowboy Country" topic wise. 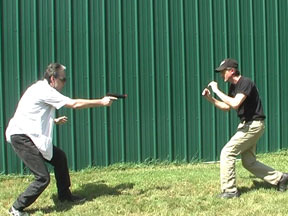 We started with the Double Pistol; something that has been seen in countless films and today in video games. But what is the logic and technique of firing two guns; is it even possible and why would it be done? What are the methods of doing it and which of them is the most accurate, and is it best used on one target or two targets as sometimes shown? After allowing everyone to answer these questions and more "guns in hand" to their satisfaction we moved into another classic American shooting skill, firing on aerial targets. When this became easy, they started to practice shooting on the move and drawing as they saw the flashing aerial target. Afterwards we had a great meal together and enjoyed some fine beer. As we sat out, I took a moment to thank all the great shooters who's work contributed to what we did; Capt. William Fairbain, Capt. Eric Sykes, Maj. Leonard Grant-Taylor, Col. Rex Applegate, Ed McGivern, and Lucky McDaniel. While their methods aren't all the same, they all were experts in the field who left behind invaluable insights for future generation. As I looked out into the sunset, I imagined all of them there with us, and it made me smile. What an evening of conversation and demonstration THAT would be!